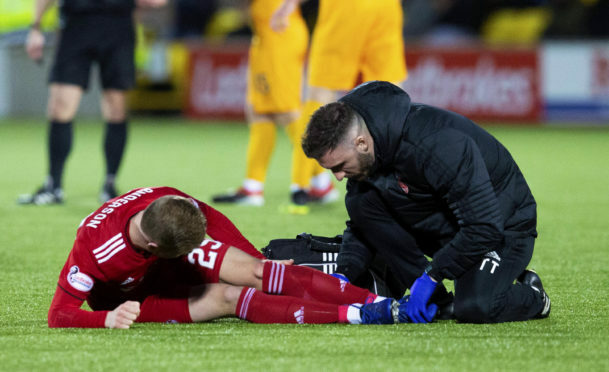 Aberdeen's Bruce Anderson receives treatment from the physio at Livingston. Anderson, 20, limped off in Saturday’s 2-1 win at Livingston and McInnes says the injury is a serious one and may prompt him to seek reinforcements in the forward area. The Dons boss is also looking for a new left back after Max Lowe was recalled from his loan by parent club Derby County. McInnes said: “I’ve enjoyed having that kind of left-back we’ve had with Max. They are had to get and Max was doing great. We would like to maybe bring one in there. Shay Logan also limped off with a hamstring strain but McInnes is optimistic about having key players available again after the winter break. He said: “We should get Logan back quickly and have Mark Reynolds, Mikey Devlin and Tommie Hoban back. There’s four defenders right away. We lost Max to Derby but he has shown me the importance of having that type of full back at the club. We will try and look to bring in something similar. “We believe Max is going back to play so it is very unlikely he would be able to return at the end of the month.